New York City Department of Environmental Protection (DEP) Acting Commissioner Vincent Sapienza today announced that following a $1 billion investment in upgrades at four wastewater treatment plants, the amount of nitrogen being discharged into the Upper East River has been reduced by more than 60 percent. These significant upgrades will improve the health and ecology of the East River, Long Island Sound and New York Harbor. In total, New York City produces, and DEP collects and treats, an average of 1.3 billion gallons of wastewater each day. The wastewater travels through the City’s 7,500 mile sewer system until it reaches one of 14 wastewater treatment plants, where it is treated to federal and New York State water quality standards in accordance with the Clean Water Act before it is discharged into local waterways. Nitrogen is a naturally occurring element that is found in food and other organic materials and is present in wastewater when it enters the treatment plants. Because nitrogen it is not a pathogen and poses no threat to human health, the wastewater treatment plants were not originally designed to remove it from the treated water before it is discharged into a receiving waterbody. However, more recent scientific research has found that high levels of nitrogen can degrade the overall ecology of a waterway by promoting excessive algae growth that can reduce levels of dissolved oxygen, especially in warm weather months. The introduction of nitrogen removal technology, which converts the organic nitrogen present in wastewater into inert nitrogen gas that is released harmlessly into the atmosphere, required significant upgrades to much of the plants’ supporting infrastructure. Some of the work included new or upgraded electrical substations, aeration systems, and sludge pumping systems. In addition, some facilities saw the installation of new sluice gates, mixers, diffusers, froth hoods, blowers, and surface wasting systems. In addition to reducing the amount of nitrogen discharged from the plant, this investment will ensure that the facilities remain in a state of good repair for decades to come. The western end of Long Island Sound is funneled into a narrow area bounded by lower Westchester, Connecticut, western Nassau, the Bronx and northern Queens and flows into the Upper East River. Wastewater treatment facilities that serve more than a dozen municipalities along the Connecticut and New York coasts are one of the many sources of nitrogen in the Sound. Coastal watersheds that drain directly into the Sound and those that drain into tributaries to the Sound are also major contributors. High levels of nitrogen in the Sound over the last few decades has led to periodic algae blooms that reduce the amount of dissolved oxygen in the water and impair the survival of fish and other marine organisms. Algae colonies can flourish with an ample supply of sunlight and nutrients, such as nitrogen. On April 5, 2001, the U.S. Environmental Protection Agency approved a nitrogen reduction plan for Long Island Sound which had been established by New York and Connecticut. The plan mandated a 58.5 percent reduction of nitrogen from the 1994 baseline, for dischargers to Long Island Sound, including New York City’s Upper East River wastewater treatment plants (Hunts Point, Bowery Bay, Wards Island and Tallman Island), the City’s Lower East River wastewater treatment plants (Newtown Creek and Red Hook), as well as wastewater treatment plants serving Long Island, Westchester and Connecticut, through a phased approach over 15 years. DEC imposed nitrogen limits reflecting the approved plan on all the New York wastewater treatment plants through the process of renewing required operating permits, also known as the State Pollution Discharge Elimination System. DEP will continue to work to reduce nitrogen discharges from stormwater runoff and Combined Sewer Overflows. In addition, wastewater treatment plants located in Westchester, Connecticut and Long Island that drain to the Sound must meet reduction targets for nitrogen discharges, and these localities are also required to reduce nitrogen discharges in stormwater runoff and Combined Sewer Overflows. 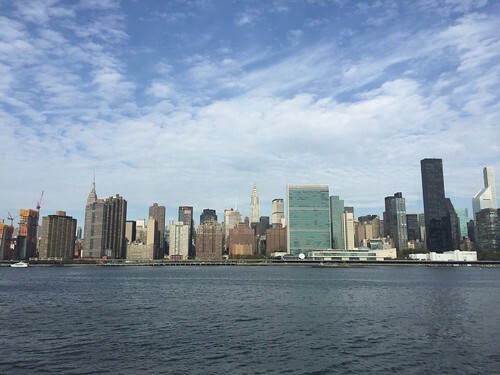 As part of DEP’s extensive New York Harbor water quality monitoring program, the reduction in nitrogen discharges into the East River and the effect on water quality will be closely monitored over the next several years. As the plan requires further reductions in nitrogen discharges, it is anticipated that Long Island Sound will take some time to respond to the changes. As the scientific data is quantified, DEP will continue to work with its partners in the region to determine the appropriate steps to continue the restoration of the health and ecology of the Sound. In addition to the work at the Upper East River plants, DEP has invested $460 million in similar nitrogen removal upgrades at the Jamaica Bay and 26th Ward Treatment Plants, which discharge into Jamaica Bay.